Compared with its staid forebears, “this Camry really wants to party.” Toyota must have known its best-selling car had to get more exciting to compete with small SUVs, and so the eighth-generation Camry cuts loose. Lower, wider, and meaner-looking than the rolling appliance it replaces, it’s now “a purple Mohawk” in the familyoriented segment it has long ruled. What’s more, power and performance have increased dramatically even as highway fuel economy jumps to a class-leading 39 mpg. 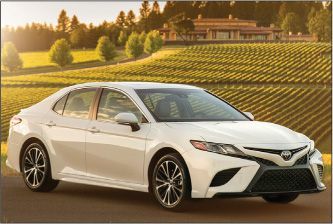 From behind the wheel, this Camry is “almost reminiscent of a Mazda,” delivering “tidy” body control and “precise and consistently weighted” steering. The new base engine is a 2.5-liter four-cylinder that adds 25 ponies to the previous model’s 185, and it’s “so good that it makes the 3.5-liter V-6 seem unnecessary.” There’s a hybrid option too, and that 53-mpg fuel sipper happens to be the most poised driver in the bunch.